Climate Kids: What is a farmer’s market, Jaret? 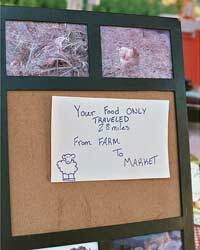 Jaret: It’s a place where local farmers sell their vegetables, fruits, beans, nuts, or whatever they have grown directly to the people who will eat it. CK: There’s no store or store keeper in the middle? CK: No big factories where the food from the farm is cooked, canned, frozen, or wrapped in plastic? Jaret: No. And no moving the food thousands of miles on a truck, train, or plane to the people who will eat it. CK: Wow, that would certainly save a lot of energy! So, where do you work? 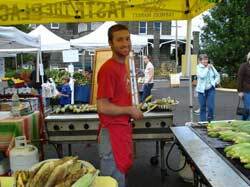 Jaret: I work for Portland Farmers Market here in Oregon. 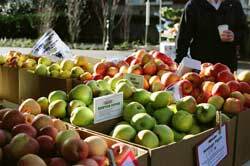 Our organization operates six farmer’s markets in different locations around Portland. CK: Are farmer’s markets open all the time, like grocery stores? Jaret: No, but you can find one somewhere in Portland on most any day of the week. Different locations hold their farmer’s market on different days, some on more than one day. Our biggest is the Saturday farmer’s market held on the beautiful park-like campus of Portland State University. CK: What could we buy there? Jaret: Everything you would need for a great meal. We have about 130 different vendors, each selling something wonderful. They have fresh fruits and vegetables, fresh eggs and dairy products, fresh meats and fish, nuts and olives, and freshly prepared “artisan foods” such as baked goods, cheese, jam, herbs, chocolates, and even soda made with fresh fruits and berries. You will even find fresh flowers for the dinner table. And if you don’t feel like cooking, you will find ready-to-eat hot foods made with fresh ingredients. CK: That’s almost like a supermarket. Jaret: Oh, much better than a supermarket. Everything will be fresh, high quality, and locally grown. You will be helping to keep small farms and food artisans in business. CK: Why should we do that? Jaret: We need these small farms and food businesses so that we can all eat locally grown foods. When our food is grown nearby, it doesn’t have to be transported long distances on trucks, trains, or planes that burn fossil fuels and contribute to global warming. We need these businesses so we can have fresh, delicious, and nutritious food that doesn’t hurt the environment. CK: Organizing a farmer’s market sounds like a big job. Who gets all those farmers and other sellers together? Jaret: As the senior market manager, it’s my job to select the vendors for the market. Every year all the vendors have to re-apply to sell in our markets, even if they’ve done it before. We have about 200 vendors, and usually we have 250 or 300 applicants. Some will not make the grade. CK: How do you pick? Jaret: If the vendor is new to us, I pay them a visit at their farm or bakery or olive oil mill or wherever the food is processed. I want to see how they work and to make sure their product is of the highest quality. If it is a processed food like jam or pickles, I make sure they are making it themselves by hand, and not just sending a recipe off to some big factory and getting boxes of jars shipped back to them. CK: How did you get interested in farmer’s markets? Jaret: I fell in love with food at a young age. When I was 16, I started working in an Italian restaurant in my home town of Helena, Montana. By the time I graduated from high school, I had worked my way up from dishwasher to head cook. CK: Wow, you learn fast. Jaret: Then I went to chef’s school here in Portland. For 10 years I worked in restaurant kitchens here, in Maine, and in New York City. In New York, I would walk through a farmer’s market on my way to work in the restaurant kitchen. It was wonderful to see the really fresh produce they had to offer. So I started working part of the year with the farmer’s market program in New York. CK: Do you miss working in restaurants? Jaret: I still love to cook and be creative with food. But having grown up in Montana, I also love the outdoors. Working in farmer’s markets is the best of both. CK: What about other people who help operate farmer’s markets? Are they usually chefs too? Jaret: Not at all. One thing they usually have in common, though, is a love of food. Some are also interested in the business part of it, or organizing a way for people to come together in their communities. 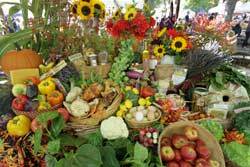 Some want to help the planet by helping people eat locally grown foods. CK: What other kinds of jobs are there in running farmer’s markets? Jaret: Each of our six farmer’s markets has its own coordinator. Farmer’s markets also need bookkeepers, publicity and communications people, volunteer coordinators, and lots of volunteers. And there are other farmer’s markets in Portland operated by other organizations. CK: What do your volunteers do? Jaret: Lots of different things. Chefs from local restaurants do cooking demos. 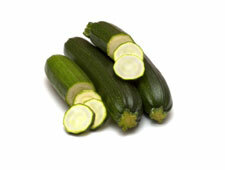 For example, they might show different dishes you can make with an eggplant. Some help lead cooking classes for kids. We even have musicians to help create a fun and festive mood. Other volunteers mingle with customers and answer their questions. CK: I bet some of the volunteers also have to go around and just pick up trash. Jaret: I’m glad you mentioned that. We have a new program we call the Evergreen Campaign. The market itself can create a huge amount of trash: Food scraps, plastic water bottles, disposable coffee cups, paper plates, packaging and other discarded items. Thanks to our volunteers, we are now recycling and composting most of this stuff, and teaching people about recycling and composting, as well as the many benefits of eating locally grown and prepared food. CK: Well, almost everyone we know loves food. Maybe it’s time we all started thinking more seriously about where—and how far—our food comes from! And what to do with the leftovers. 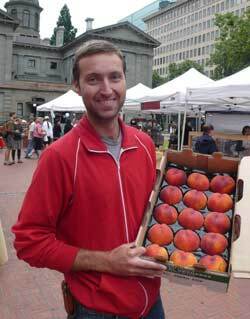 "You can get big, juicy fresh peaches when they are in season at our farmer's market," says Jaret. Think of the savings in greenhouse gas emissions! This market makes an 'apple a day' a wonderful treat! Jaret loves food, cooking, and being outside. Everything for dinner, plus flowers for the table. 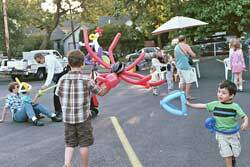 Fun activities help make market day a success. The Saturday market at Portland State University campus has around 120 vendor stalls. 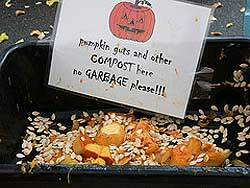 Portland Farmer's Market recycles as much of the trash as possible, and composts the food scraps.